Allows players and mobs to move through it. Thatch is made with four straw. Placing a single block of thatch in the crafting grid will return the 4 straw, making thatch blocks a compact method of straw storage. Thatch is one of the earliest roofing blocks available in the game. Unlike dirt and cobblestone, thatch is not affected by gravity so it can be used to create unsupported spans for roofing. Thatch has an advantage over logs in that it can quickly and easily be removed by hand. 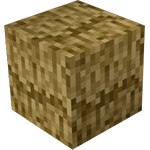 Note: Players and mobs are able to move through thatch, making the block essentially useless for walls that do not contain at least one other material. While moving through thatch, both players and mobs will have a slowed movement speed. Thatch also cannot be used to pillar up to safety, as the player will simply fall through the block when they jump on it. Hostile mobs will not be able to spot a player who is already hiding in a thatch enclosure, but they are able to follow players through thatch if they have been aggro'd while the player was outside of the thatch. Thatch is also extremely flammable, and any thatch structures that are built near an open flame such as a pit kiln will quickly burn to the ground. Two adjacent thatch blocks can be turned into a Straw & Hide Bed by standing on one end so that the two blocks are in front of the player and right clicking on the nearest block with a Large Raw Hide. Added Straw & Hide Bed made from 2 thatch blocks and a large raw hide in the world. Thatch can be converted back into 4 straw. Thatch is no longer a solid block; redesigned to more correctly match their intended purpose as an early game roofing material. Thatch cannot be placed on blocks of ground material (dirt, grass, etc.). Removed placement restrictions on thatch blocks. Attempting to place collapsible blocks like dirt on top of thatch will break the thatch block. Thatch is washed away by water. Mobs can no longer spawn inside of thatch blocks. Because thatch blocks light, but allows the player to travel through it, it makes an excellent material to use as a door for food cellars. This page was last modified on 19 July 2015, at 05:27.